One of the many benefits of living in Las Vegas is having my mom here, making her available to take the kids for the weekend. And since today is Brett's and my 8th wedding anniversary, we had my mom take the kids for the weekend. They got to spend the weekend with their Nana and GrandPaul, and we got to spend the weekend alone. On Friday night we went out for sushi at our new favorite sushi spot. I wanted to try something new and I order a fire cracker. 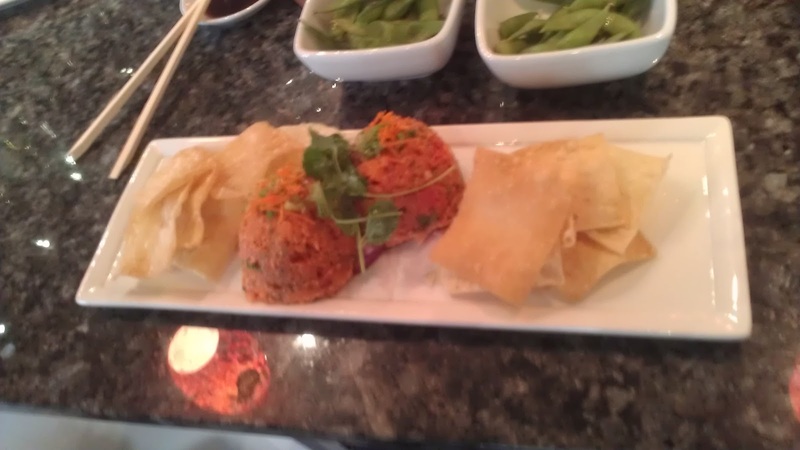 It's spicy tuna mixed with tomatoes and served with fried wonton wrappers. IT.WAS.A-MA-ZING! I will order it every time we go now, that's how good it was. After our sushi dinner we went on a nice long walk. It was a great night and we had so much fun. The view was worth the 1 hour climb. Saturday night we went to a brewery for dinner and saw a movie. For our 8 year anniversary, I let Brett pick a horror movie. He was rewarded for this nice act at 1am when his phone rang and I screamed and thrashed around in the bed trying to kill my imaginary attacker. This is not uncommon for me, and I really do take a long time to wake up. And then it takes me a few hours to calm down. Not fun. On Sunday we did something we NEVER get to do. We watched both of our football teams play. At a bar. The first game during church. We felt very naughty in a good way. I can't remember the last time we watched a game without a million interruptions. And my team won! Brett's team- well-didn't. Then we took our old selves home for a shower since we smelled like an ash tray (why I don't miss hanging out in bars) and then we picked up the kids. The weekend flew by and we had s much fun. I didn't feel guilty once about leaving my kids for the weekend. I'm so glad that I can get away for the weekend and not feel guilty for one second. Happy Anniversary Brett! It's been an interesting, exciting, exhausting, love filled, twist and turning 8 years and I'm looking forward to many more years with you!